A US underwater investigator has said he believes he has found the wreck of the Santa Maria, the flagship of Christopher Columbus's famed expedition. Barry Clifford said evidence "strongly suggests" a ruin off Haiti's north coast is the Santa Maria. Mr Clifford's team has measured and taken photos of the wreck. He says he is working with the Haitian government to protect the site for a more detailed investigation. 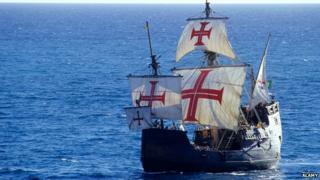 The Santa Maria, along with the La Nina and La Pinta, were part of Columbus's expedition in 1492, which explored islands in the Caribbean in an attempt to find a westward passage to Asia. The flagship was lost during the expedition, shortly before Columbus returned to Spain. "All the geographical, underwater topography and archaeological evidence strongly suggests that this wreck is Columbus's famous flagship, the Santa Maria," said Mr Clifford. "I am confident that a full excavation of the wreck will yield the first-ever detailed marine archaeological evidence of Columbus' discovery of America," he added. Mr Clifford said he identified the potential location of the Santa Maria through earlier archaeological findings that pinpointed a likely location for Columbus's fort - a building that experts always thought was erected near to where the ship ran aground. He also used information from the explorer's diary, and a recent diving mission near the site further burnished Mr Clifford's belief the wreck was the Santa Maria. Mr Clifford told US broadcaster CNN the "smoking gun" was a cannon of 15th Century design found at the site. A marine archaeologist who accompanied Mr Clifford on that mission told the newspaper there was "very compelling evidence" but an excavation of the site would be necessary to confirm the wreck's identity. Further investigation will be supported by the government of Haiti and the History Channel, which plans to make a documentary programme about the wreck. Mr Clifford is best known for the excavation of the first fully verified pirate shipwreck, the Whydah. Should shipwrecks be left alone?